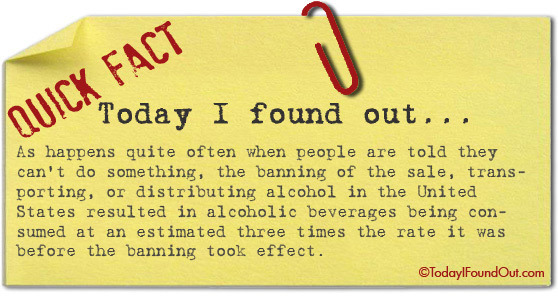 As happens quite often when people are told they can’t do something, the banning of the sale, transporting, or distributing alcohol in the United States resulted in alcoholic beverages being consumed at an estimated three times the rate it was before the banning took effect. It also gives rise to a new, wealthy criminal class. It happened with prohibition and it’s happened with “the war on SOME drugs”. Politicians, despite participating directly in history, are unable to learn from it. The real solution would be to make all drugs legal and free and dispensed solely by the government. This would instantly put all of the drug gangs and dealers out of business. It would also end the corruption and resulting disdain, distrust, and disrespect of the legal system. Common sense and human decency have never been obstacles for theists when they demand to have their sick beliefs as law.